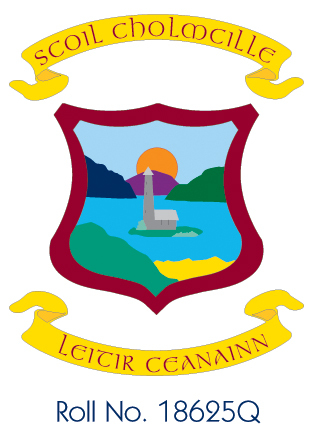 The school crest of Scoil Cholmcille was painted by former deputy principal, Frank Breslin. He was inspired by the story of Colmcille, who was born in Gartan, Co. Donegal, and spent all of his life spreading the Christian faith. Colmcille studied in Moville, Strangford Lough before moving on to Leinster. He spent time in Meath and then Glasnevin before the plague arrived in Leinster and he was forced to move back to Donegal. He was granted a portion of land at Daire Calgach on the west bank of the Foyle. Here he built a church called Dubh Regles. “Daire” is the Irish for oak tree and in time this place gave its name to the city of Derry. Colmcille founded monasteries in many parts of Ireland and made a lasting impression on all he met. He was forced to leave Ireland and set sail for Scotland. King Conall granted him the island of Iona and he founded a monastery here. This became a thriving place and Colmcille proved himself to be a caring and sensitive Abbott. He made trips home when he could as he always missed his native land. Finally in his 76th year, he sensed the end was coming. His last action was to prepare the church for Mass and he was found dead on the later. Our crest depicts a monastery setting beside water and this could represent the original monastery in Daire or Iona. It symbolises the work Comcille did in spreading the early Christian faith and the tireless energy he brought to the work he loved.